I had a great long weekend – especially with a Friday AND Monday off of work. My time off was restful, though rather uneventful. Rather than another weekend update I figured it’d be fun to kick off the short work week (and back to school) with a new workout every day this week. 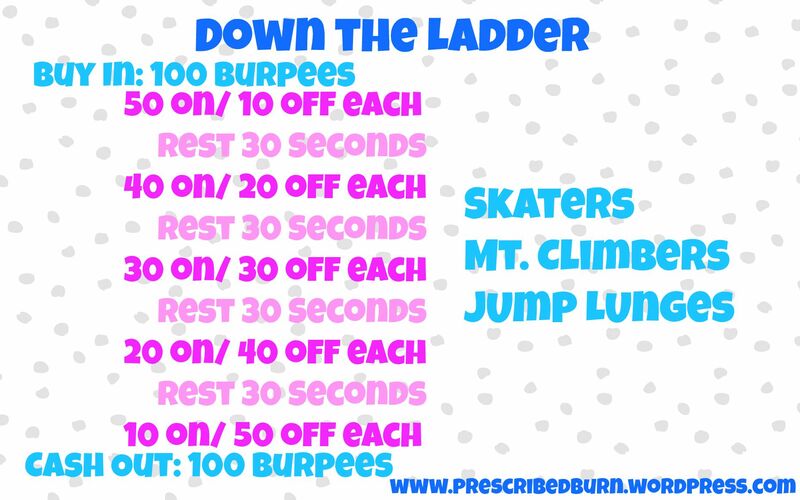 It will be a challenge for me to get them up and posted and a challenge to everyone to complete each workout. These will be relatively short HIIT workouts. So, add them to your normal routine or carve out some time to get one in on an extra busy day! This one below will challenge you to work your way “Down the Ladder”. The rest periods get longer as your body gets more fatigued. Give it all you’ve got as your work periods get shorter. Before you begin, start with a full minute of burpees – as many as possible. End the workout the same way!